Here is a story that is based on actual events. It demonstrates the notion that humankind finds difficult a world view that might suggest its event flow is unified with our consciousness and so, we speak in metaphors and simile, employing trite vagaries that offer no reasonable explanation for any of the trials that lead to our suffering and for which we cannot reconcile any truth because of our profound ignorance. A friend of mine, who came to help around the farm, found me hard at work repairing broken stalls inside my barn. It was a series of events, such little things I do not care to say just what they were, that brought me to the fit of anger I was in when he walked through the door. He asked me what was wrong and I, in desperation, tried to find the words to tell him straight that I had had enough of bitter disappointment. He fumbled for some soothing things to say and, being “born-again,” counseled me quoting scripture like a Paul of Tarsus. He spoke of Job and Daniel too, and Christ, and Calvary—and he gave me tender reassurance that I was not the only one who suffered. I tried to lead him through my life with explanations, that I knew, he hardly understood for, having never been to anywhere inside my mind, he couldn’t see my only point of view. At once my jumbled thoughts began to organize around that allusion which seemed to form the essence of his faith and realized just what it was that bothered me about my own existence. “A plan you say,” I asked of him? Friends are common men grown weary of all the things that must be done to make the earth provide for us. You have to live for years before your reasoning can ascertain just how remarkable is effort spent by flesh and blood to keep abreast of Nature as the whole of the Cosmos creates and then destroys, crushing every static thing that lies within its path. And there you are, a puny human being—your fingers in the mud—trying to live a brief interlude in history; perhaps you pick some things to eat along the way, and then you’re gone! Businessmen make light of it. “That’s life,” they quip! That is, until they’re hungry. When they’re hungry, they’ll hunt you down! Kill you! Or, at the very least, hire some fool to do the bloody work for them but they’ll survive; they’ll make damn sure they live to sell another day. Clergymen explain that it’s Divine Will, that is until they’re the ones left without a reasonable answer. Then they’ll fashion villains who always take the form of devils masquerading as human beings with different ways and different creeds and, God knows, different faces! Politicians claim we must “press on” but linger in our collective consciousness as archetypes of intellectual vacuity—a bane upon our collective consciousness long after they’ve exhausted all of their usefulness. I’m not the first to see the pretense in the claim that humankind is worth “fighting” for—but fighting for what or for whom? Hypocrisy suggests that our human community is worth dying for—but does anyone ever take the time to think about what dying is all about? Dying means rotting away into the mud! Think on this the next time you put your fingers into it. If I had not become so pretentious, living through each day to eat some food, find warmth beside a fire, love and be loved, and be busy with something constructive to do might have been enough. But I had to get an education! I had to get “cultivated!” A wild man out on the savannah would have struggled to live expecting life, for him, to someday end but never knowing where or when until the very moment of his death. Here, within our tempered human institutions, we cloister with our kind to build a better life for someone else, expecting to live on. We cover both our eyes and hope and pray our useful lives away awaiting some external power to sweep us from this awful situation our language labels “life!” We expect God to mitigate the awesome force crushing down upon us since the day that we were born, forgetting that, if what we say is true, then God fashioned this reality to do just that! Yet we carry on this way because we have defined our civilization in these terms—to no one but ourselves. I’ve dreamt of going back in time to when I was a young man in my memory—to when I had control; control of what it was I thought life should have been. But now I’ve lost the source of all that hope learning life to be whatever it is that it could have been and reckon damn few of us consent to think about it anymore, buried in the gloom of deep disgust. The sixties came and left before I got the chance to know just what it was that passed me by. Now I only remember the restless chords and reckless lyrics of the music which always gave us food for thought. We have unleashed our blatant indiscretion upon the very mud in which a Mozart lies buried and upon which countless thousands sat at Woodstock. We have turned our backs on all the aging troubadours who, singing from the heart, reminded us how very vulnerable we all were, afloat on wooden ships, and, facing death, laughed quietly within their hearts suspecting any time would do. Oh, we were full of power then! But it’s been a long, long time since I could feel as though my flesh would live forever. All the mana has gone out of me. My faith is crushed. I am broken. I am beaten. I am spent. My father died some years ago. It pained me so to see him cold and still, his face without expression, lying in his modest coffin. As my heart swelled with sorrow, I thought: “My how we had grown so far apart since I was five years old; since that sunny Easter morning when, just to tease, he ate my candy chicks and claimed that it was magic that made them disappear!” I wished that I might have had the chance to be his friend but, in the end, remained his son whom he would leave behind. Some time ago, I remember visiting a friend. He was dying—all thin and weak from infection; his skin pallid and barely there. I caught myself staring at him the flesh about his neck had dissipated so, I wondered how he kept that head of his aloft! He turned to me, smiled, and said hello. He knew that I was aware of his condition. He was trying to be brave, poor fellow. But, when I looked into his eyes I saw them welling up with tears and through them perceived a terror that had finally worked its way down deep into his soul. He drew nearer to me and caught the sleeve of my shirt. “I’m dying, my friend,” he whispered through quivering lips, “please help me to bear it!” And, I could not! I could not even find some simple words to break the tension of the moment! I found myself gazing stupidly back into his face. He let go of my sleeve and lowered his eyes—the passion ebbing from his face as he did. How could I have said anything to him? Should I have told him about God—the God that had fashioned his life, step by step, into an event flow so vast and intricate that a normal human mind could not comprehend the meaning of it? And, once all of his mistakes had been made, once he found himself the slave of his ignorance—the profound ignorance of our reality which we all share—life, itself, infected him with that dreadful disease! Poor, wretched man—slipping away into the pit of despair from which he would never return! In the newspaper today I read, in bold lines upon the front page, proclamations of “thanksgiving.” And in a small corner of another section, buried in the prattle of personal opinions, I found a very short story that told me of how the African sun beat down upon the starving bodies of little children who, consumed by deprivation, could not run this “runner’s race” and keep abreast of living and, wouldn’t you know it, this chunk of rock we’re all living on kept right on spinning into another day. What hope is there in that? You see my point, don’t you? There! Now I’ve told you! We’ve learned to lie and lie quite well about the choices we have made. The bitter truth is that we have no choice at all. I think, no, there is no plan except the one that guides the force that runs us down into the mud and grinds us up until we all are naught but cosmic dust; an endless chain of circumstance and nothing more. I wish that we all could stop portraying life with metaphor and simile, to be much better than it really is but we cannot. Just tell me what the hell I’m doing here! I never begged to be born! And, if God is so dissatisfied with me, then it is God’s own doing for thus have I been made! Considering the system God is said to have ordained upon this planet, it is a miracle that I’m alive at all! So, what can God expect from mud fashioned into trouble? My friend thought it prudent to leave not having helped in any way he could perceive would do me good. “I’ll pray for you,” he said. As he left, he turned to say goodbye but just raised his hand and I raised mine. 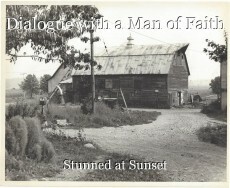 I remained in the doorway of the barn for quite some time after he had gone and, from my vantage point, could see that I was standing at the center of the Universe, naked and all alone. © Copyright 2019 Stunned at Sunset. All rights reserved. WHAT IS TRUE, IN IT'S PUREST FORM?